I have a long commute so last week I decided to make the most of my hour-long train ride and test the new Models Own Artstix Duos. And boy, did it perk up my journey! 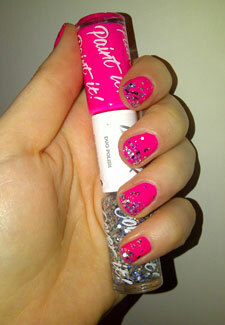 The first step is to apply the colour base coat – I used the bubblegum pink and silver combo of the Blibble duo. Considering I was squashed in on a moving train, the thick formula and sizeable brush made it easy. The pigment is so punchy, I only needed one coat so after waiting a minute I applied the special effect top coat across the whole nail. I wanted to create a staggered effect, layering more glitter at the tips – which, by the way, is great at preventing chips! I added two more coats of glitter, concentrating on the ends of my nails. This is a glitzy look so definitely more suited to an evening out but it’s a fun and easy way to dip into the nail art trend – even when you’re on the train! The Models Own Artstix Duos, £6, go on sale this Saturday.